This was a timely and important conference which followed closely media reports on the ways in which technology may change the nature of the way in which war will be fought in the future. For example, the Independent (https://www.independent.co.uk/news/uk/home-news/future-war-robot-soldiers-enhanced-humans-space-gene-editing-ministry-of-defence-a8583621.html) reported on a Ministry of Defence report predicted that robot soldiers and ‘enhanced’ humans will fight future wars, and technological advances will see new frontiers for warfare opening up in space and cyberspace. The conference was organised jointly by Yorkshire and London Region CND, with help also from the National CND Office. 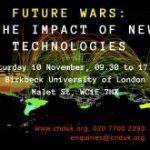 The aim was to bring together technical experts, commentators and campaigners to examine the kinds of technologies that are being considered, investigated, and developed by the military and to consider and discuss alternatives. The conference was free as the intention was to attract as wider ranging audience as possible, with little or no previous knowledge. However, a registration system was set up through Eventbrite and we soon became over-subscribed. The grant obtained from the Scurrah-Wainwright Trust enabled us to book rooms of a good size at Birkbeck University and to invite a range of speakers from the UK and overseas. With the help of pre-recorded interviews and live video conferencing, we were able to include presentations from politicians, scientists, engineers, investigative reporters, activists and analysts from the U.K., the U.S., Switzerland, France, Spain, and Germany, speaking in plenary and workshop sessions. Publicity was achieved through the large number of postcard size fliers (see above image) and distributed through CND, peace and Quaker groups around the country. Various national and international organisations supported the conference, including the Bertrand Russell Peace Foundation, Campaign Against the Arms Trade, Drone Wars Network, International Network of Engineers and Scientists, International Peace Bureau, Irish Peace and Neutrality Alliance, Medact, Pax Christi, Delas Center for Pace Studies, Scientists for Social Responsibility and War on Want. An article written by Carol Turner was used as an initial press release and was sent put to media contacts, it was published in full in the Morning Star (see: https://morningstaronline.co.uk/article/new-technology-and-war-view-dark-side). We also had an excellent presence on social media before and during the conference and attempted to live stream the whole event. 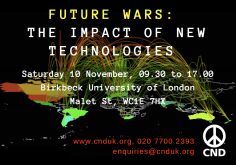 Although this was not entirely successful, recordings can be viewed on the CND Facebook page at: https://cnduk.org/future-wars-videos/. The twitter feed from the conference can be viewed here: https://twitter.com/i/moments/1062031322959495169?ref_src=twsrc%5Etfw%7Ctwcamp%5Emoment&ref_url=https%3A%2F%2Fcnduk.org%2Ffuture-wars-conference%2F. Two previous conferences had helped to identify relevant technological concerns and possible civil society responses as well as provide an overview of the academic research and levels of public awareness in relevant areas of technology. The first, organised by Dave Webb and Steve Wright, at Leeds Beckett University, titled “Emerging Weapons Technologies & Human Rights Implications”, was held in 2017 on November 16th, as part of the University’s annual “Festival of Politics and International Relations”. The second, an “Expert Symposium on Artificial Intelligence, Autonomous Weapons and Border Control” was partly organised by Steve Wright and at which Dave gave a presentation, was held from 12-13th July 2018 at the Open University. The opening session – “The shape of things to come” was chaired by Carol Turner from London Region CND and featured a speech from Ted Seay. Ted is a senior policy consultant for the British American Security Information Council (BASIC) in London, prior to which he served for 26 years as a U.S. Foreign Service Officer, most recently (2008-11) at the US Mission to NATO as arms control advisor. He gave a strategic overview of US plans for, among other things, the development of new, smaller, more ‘usable’ nuclear weapons and how this brings us even closer to the possibilities of a nuclear exchange – even leading to a possible “nuclear winter” that would result in widespread famine and depravation, affecting billions of people. He highlighted the need for global opposition to plans to renew nuclear arsenals and for nuclear weapon states to take their obligations to work for nuclear disarmament seriously. Dr Stuart Parkinson, Executive Director of “Scientists for Global Responsibility” (SGR), updated us on “Military-University Collaborations in the UK”. Recent studies have shown most UK universities to have at least some links to military interests – and some have extensive links. Military funding is provided by UK government military organisations, UK and overseas major arms companies, and other overseas organisations – such as the US Department of Defense. Academic funders – such as the Engineering and Physical Sciences Research Council (EPSRC) – also co-fund numerous research projects with military funders. The EU is now also launching new programmes for military research worth billions of euros and some of this at least is likely to be picked up by universities. UK university military research tends to be concentrated in engineering departments, with computing, physics, maths and chemistry departments also receiving significant amounts. The funds tend to be mainly for applied research, although some does go to basic research, and it is claimed that secret work is usually carried out in government or industry laboratories, rather than universities. Between 2011 and 2012y government spending on military R&D rose by over £150m, while public civilian budgets were cut by a similar amount. In addition, there has been an increase in spending on ‘security technologies’ – including crowd control and surveillance, as well as cyber security. The military is in a strong position to make use of such technologies for supporting its own activities. So, as Stuart says, “the military influence on UK universities – and science and technology more broadly – remains powerful” and groups such as SGR working through universities networks – are very important in helping to keep up the resistance to this influence. Professor Stephen Rose from the Open University presented “Nuerowar in the Novichok Era”. He saw Chemical Weapon agents being used in two roles: against civilian populations in asymmetric wars and in specific covert missions. The good news is that the prohibitions against Biological Weapons seem to be holding, possibly because of the uncertainty about their efficacy and control. Meanwhile however, rapid advances in understanding and manipulating the brain, are being weaponised. The $4.5 billion BRAIN programme (Brain Research through Advancing Innovative Technologies) launched by President Obama in 2014 included a substantial sum allocated to DARPA (the US Defense Advanced Research Project Agency). There are active research areas in lethal and non-lethal psychochemicals. Potential lethal agents range from natural toxins (such as ricin) to genetically engineered variants and the oft-rumoured ethnic weapons. The non-lethals (sometimes called riot control agents, made available to military and police forces) include tear gas (such as CS gas) and some newly synthesized substances for incapacitating, disorienting or paralysing. There is also research into ‘memory erasers’ and ‘trust inducers’ and drugs widely used by the military to enhance cognition, attention and wakefulness among so-called ‘war fighters’ such as pilots. DARPA also funds research into direct brain-computer interfaces to assist and speed decision-making and intelligence gathering for flyers and drone pilots. Interest in the use of microwaves to disorient an enemy and disrupt communications has been reinforced by powerful laser and magnetic technologies. These technologies also have possibilities in terms of interrogation/surveillance and control techniques and many of these developments have a dual-use, with civil and medical uses – making the possibility of effective arms control measures, difficult – even if there was an international environment for such treaties. Presentations by Arielle Denis from the International Peace Bureau and Jean Lambert (Green Party MEP for the London Region) gave wider peace and political perspectives. Arielle presented the concept of ‘humanitarian disarmament’, bringing a whole range of actors together to challenge the ‘realists’ in power who are working in conjunction with the arms manufacturers, to promote the idea that “more weapons bring peace”. She used ICAN’s campaign for a Treaty for the Prohibition of Nuclear Weapons (TPNW) at the UN as an example of how a focus on humanitarian consequences of these technologies can be successful. “Our choice is to continue to stand up to make new approaches for collective human-based security or resign ourselves to the will of the nuclear states and the arms manufacturers” she said. Arielle also brought along one of the Nobel Peace Prize medals presented to ICAN in 2017 in recognition of their work. There was a long line of people taking selfies with the medal during the break. Jean Lambert focussed on the impact of wars on migration and refugees. We are told that new technologies enable weapons to be better targeted with less civilian casualties but, although combatant casualties may have decreased in some cases, the effect on civilians depends on the “willingness to avoid casualties” which is not often apparent. In Yemen, for example, just last weekend there were over 100 airstrikes amidst warnings that thousands of children are in the line of fire and vital food and medicines are not reaching people already on the verge of famine. 20 million people there are in need of humanitarian assistance and trapped by conflict. For those that manage to leave, sanctuary is not assured. Globally, there are around 244 million migrants – just over 3% of the world’s population. Most emigrate in their region and the vast majority for work purposes. So, there is not an invasion! However, the people who have become displaced through no choice of their own is at an all time high at 68 million, about 50 million of whom are displaced within their own borders. The vast majority of those crossing borders are in fact going to low income countries close by – not Europe. They are leaving broken countries, Syria, Afghanistan, Iraq, South Sudan, ravaged by war. Jean went into some details of the horrific humanitarian cost of these wars now also being added to by the effects of climate change. Governments affected cannot cope and when we talk of war and the use of new technologies, we must consider the consequences and adopt different, humanitarian approaches to deal with conflict. The second plenary session – “The Militarisation of Space” was chaired by Cath Ban from Yorkshire CND and featured a recorded interview between Dave Webb (IPB Vice President and CND Chair) with US peace activist Bruce Gagnon, coordinator of “The Global Network Against Weapons and Nuclear Power in Space”. It was recorded in Oxford at the annual meeting of the Global Network which was held there in June. He spoke of President Trump’s announcement that he had directed the Pentagon to develop a ‘Space Force’ – a new branch of the US military, “separate but equal” to the US Air Force – to ensure the “American dominance in space” – the possible consequences of this are extremely serious. The US defence budget for 2019 includes funding for the development of space-based missile interceptors which could lead to a major increase in global arms spending and edge the world even closer to a nuclear war. President Trump’s plans to fund the building of space weapons are reminiscent of Reagan’s ‘Star Wars’ ideas and, although the Outer Space Treaty, the basis of international space law, recognises “the common interest of all mankind in the progress of the exploration and use of outer space for peaceful purposes” and emphasises the importance of cooperation in space for strengthening good relations between states, unfortunately it is not worded strongly enough to prevent an Arms Race in Outer Space. The positioning of US and NATO missile defence radars and interceptors in Europe and Asia, close to the borders of Russia and China are examples of a growing provocative strategy. By challenging the possibility of retaliation, they represent components of a nuclear first strike system by the US and Trump is now considering stationing interceptors in space to give a world-wide coverage. However, there are groups and communities around the world protesting at the ground-based stations, installations and manufacturers that support military operations in space. They provide information and campaigning ideas to the network and combine to provide a global opposition. Dr Patrice Salzenstein from Mouvement de la Paix went on to explain how some analysts have argued that the 2015 US Space Act violates the Outer Space Treaty by an encouragement to exploit space assets such as water and rare minerals. He also outlined the role of two second generation French military satellites – Helios 2A and Helios 2B, (first launched in 1995) and the Pléiades 1A and Pléiades 1B imaging satellite systems. France is also a partner in MUSIS (the MUltinational Space-based Imaging System) for surveillance, reconnaissance and observation which enables imagery and information to be shared with partners Italy, Belgium, Germany, Greece, and Spain. A project of the European Defence Agency (EDA), it is managed by the “Organisation conjointe de coopération en matière d’armement” (or OCCAR, the Organisation for Joint Armament Cooperation. Future satellites designated COS 1, 2 and 3 will be under the control of the French Ministry of the Armed Forces. They will be useful in providing information to be used for producing maps for guiding missiles and drones and helping plan and execute airstrikes. The French peace movement is aiming to help establish debate on the need to keep space for peace. They support and encourage initiatives to denounce the militarization of space and oppose French militarization space programs of space and make France an example for other countries. The third plenary session consisted of two parallel plenaries: ‘Blowing the Whistle on Surveillance’ and ‘Armed Robots and Drones on the Battlefield’. Blowing the Whistle on Surveillance was chaired by Dave Webb and involved investigative journalist Duncan Campbell via a recoded speech and a video conferencing link. Duncan described his key role in uncovering the US ‘Echelon’ surveillance program operating in the UK at Menwith Hill in North Yorkshire, and elsewhere. Echelon has since been extended from the original post-war intelligence collaboration of the ‘five eyes’ (US, UK, Canada, Australia, and New Zealand) to become an extensive global intelligence gathering network of around 35 eyes (named ‘Fornsat’ as revealed by Edward Snowden) and controlled by the National Security Agency (NSA) of the US. The unravelling of the Echelon programme was made possible by several whistle blowers – who were very much involved in the programme but became disillusioned about its motives and its consequences. The story is also recounted by Duncan in an article “GCHQ and me” on Open Democracy (https://www.opendemocracy.net/ourkingdom/duncan-campbell/gchq-and-me) and also in the on-line journal ‘The Intercept’ (https://theintercept.com/2015/08/03/life-unmasking-british-eavesdroppers/). Whistle blowers were also the theme of the later talk by Lucas Wirl from the International Network of Engineers and Scientists (INES) and IPB who pointed out examples of dissent from scientists, engineers and workers that had changed the behaviour and activities in some major industries. Perhaps the most recent example being the Google workers, over 4,000 of whom signed a petition, some even resigned, against the company’s involvement with ‘Project Maven’. This AI project being developed for drones aims to identify objects in up to 38 categories to speed up and facilitate military intelligence operations. The protest received a lot of publicity and led to Google changing its policy on working with the military. Project Maven was also discussed in the second parallel plenary on Armed Robots and Drones on the Battlefield. Chaired by Amy Keegan (National CND Parliamentary Officer), this session heard from Artificial intelligence expert Pere Brunet of the Delas Centre for Peace Studies (and IPB). He provided a warning for the future, saying that “robotic weapons can be easily assembled from on-the-shelf components by any almost country or organisation”. The session also included the launch of a new report entitled “Off the Leash” (https://dronewars.net/2018/11/10/off-the-leash-autonomous-drones/). The launch was presented by the author Peter Burt of Drone Wars UK and Drone Wars founder Chris Cole. They argue that UAVs are likely to be the ﬁrst truly autonomous weapons systems that can not only can ﬂy themselves for extended periods but may also “select, identify and destroy targets without human intervention.” Although the British government expresses opposition to developing armed autonomous systems, it has not supported UN moves to ban them. Leaders of Britain’s armed forces, on the other hand, have endorsed them. The report contains many suggestions for the UK government which, as a responsible and leading member of the international community “has a duty to use its influence and powers to ensure that the weapons of the future are never used outside boundaries set by the laws of humanity and the requirements of the public conscience”. The afternoon sessions consisted of two parallel workshops. One on surveillance was facilitated by Cath Ban, from Yorkshire CND, and Lucas Wirl. The other, on Armed Robots, was facilitated by Chris Cole and Pere Brunet. These workshops gave participants the opportunity for further comment, to share information and suggest ideas for possible future work/actions, etc. The final session chaired by Tom Unterrainer from the ‘Bertrand Russell Peace Foundation’ (Bertrand Russell was a founder member of CND 60 years ago) and allowed Lucas Wirl, Dr Elke Schwarz (lecturer in Political Theory at Queen Mary College University, London) and Sara Medi Jones (acting General Secretary of CND) to emphasise the ethical, military and political problems of developing these technologies. Not only do developments in technological warfare increase the possibility of suspicion, mistrust and confrontation (possibly nuclear in nature) between states but they also drive up global military spending as states also compete to develop ‘protections’ against them. Through this conference CND sought to inform and mobilise people by organising the conference and to discuss the real alternatives to a new arms race – a focus on people’s needs, development and disarmament and work towards a culture of peace. Judging by the responses of people who attended, it successfully achieved this. Some of the papers presented are due to appear in a future edition of “The Spokesman”, the journal produced by the Bertrand Russell Peace Foundation.